Drawing on various aspects fo the two epic poems attributed to Homer, the Odyssey and the Illiad as well as the summer school's main event, the exhibition brings together works that make connections between past and present and/or use fiction and mythology as a means to speak of wider topics. These vary across the mediums of performance, sculpture, painting, sound and screen-based works. 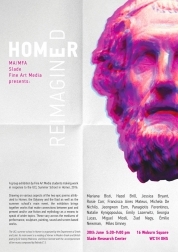 Mariana Bisti, Hazel Brill, Jessica Bryant, Rosie Carr, Francisca Aires Mateus, Michela De Nichilo, Jeongwon Eom, Panagiotis Ferentinos, Natalie Kynigopoulou, Emily Lazerwits, Geogria Lucas, Miguel Miceli, Ziad Nagy, Emilie Newman, Miles Umney.